The holidays are the season for giving. At workplaces across the country, employees start charity drives and/or events to raise money and gifts for those who are in need. While the concept is simple, planning an effective charity event is actually pretty complex. To help you ease the stress and ensure a successful event, we talked with several experts, including Jerome Tennille, a Navy veteran and manager of volunteerism at Marriott International. Tennille said there are three principles you need to understand before you start: Meet the needs of the community you want to serve, have a compelling call-to-action for your fellow employees and make it easy to participate. This is the first step in the process. Stephanie Jones, founder of Giving Gal, suggests taking a quick poll during work to find out what’s compelling. Once you’ve identified the cause, then take some time to figure out how you can best meet the needs of those in your community you want to help. Tennille said this step is crucial to running a charity event or drive that is truly effective. “When I say it must meet the needs of the community, what I’m referring to is the necessity to do research to identify the issue in society, and then connecting with an organization you can work with to set up the collection drive or fundraiser,” he said. 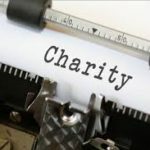 You may find that the organization or cause you want to work with would be much better off if you helped them in, say, July, than during the holiday season. Fundraisers, whether done over the course of a few weeks or at a one-time event, aren’t going to be successful unless you’re able to get the word out to your co-workers. You’ll want to do this at least a month before the drive or event happens so that everyone knows who they’re donating to and what they can donate. Work with your team to plan when/if you can make announcements about the charity effort during a meeting. Place flyers in the break room and, when appropriate, send out details via email. The last thing you want is a charity drive or event that interrupts the workday or impedes the focus and workflow of your office. If you’re running a toy drive, be smart about where you place your donation boxes. You don’t want them to be a distraction but, at the same time, you want them to be visible enough to remind people they have a chance to be kind. If you’re doing a one-time fundraising event, he said, then make sure you plan it during a lunch break rather than another time when everyone usually works. The disruption discourages people from participating and could cause your event to be viewed as an annoyance rather than an opportunity. Matt Dodgson, director of U.K.-based Market Recruitment, said his team came up with a gift-wrapping fundraiser that ended up being a positive, helpful experience for his team. His office was full of creative people who happened to be good at gift wrapping. So, the company decided to run a gift-wrapping drive in which they reached out to family, friends, clients and the community around them, he said. The event was a success because Dodgson and his colleagues started their planning early, made a concerted effort publicize the drive and they ran a well-organized campaign in which they had a pair of gift drop-off spots. His company used Google forms to allow people to choose a date and time to drop off their presents to be wrapped. Also, he said they used a tiered pricing model in which smaller presents were cheaper to wrap and bigger presents were more expensive. People were happy to pay for gift wrapping when they knew the funds were going to a charity.